If a ski and snowboard glove is too small, it will be uncomfortable. But if your ski or snowboard glove is too big, your hand will have a hard time warming up the inside. So selecting the correct ski and snowboard glove size is important. For best results, take measurements of your width and length. 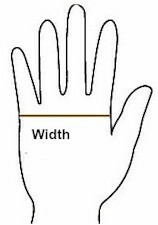 Most gloves sizes are determined by width but some people have long fingers. Select your glove size to whichever is longer. When between sizes, go up a size. Take measurements of your width and length. Because mittens have more room, width is the most important measurement. When between sizes, go up a size. Glove Width: Measure the circumference of your hand between your thumb and knuckles while making a fist to get your glove width. 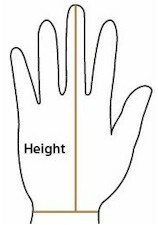 Glove Length: Measure your hand from your wrist to the tip of your longest finger for your glove length. There are a few other things to consider when sizing. Use our glove and mitten sizing chart only as a reference. A slightly larger glove will be more comfortable but takes more body heat to keep warm. A snug fit takes less body heat to warm up. If you wear liners, go larger as liners make your hands larger. Get warm feet with Real Fur Boots! Wooly gloves or mittens are great for around town are super warm! Quality leather ski gloves keep your hands warm with style. If you spend alot of time outdoors in the cold, the best way to keep your fingers warm is with battery heated gloves or mittens by Therm-ic. Matching gloves and hats make your snowboard outfit.